I use to work at 3826 Walmart. Now I’m a customer I’ve been getting treated terribly bad. The employees there are rude and asking why I come a lot which I don’t. I go there 2 days out of the week. So for now on I will shop a a different Walmart even though this one is really closer to where I live but I rather go to a different Walmart that will appreciate my business, won’t be rude and hopefully they will have more cashiers instead of 2. I have always been an Amazon /Ebay shopper (and seller) and buy everything I can online, somehow, inexplicably avoiding Walmart. Last year I purchased a boat cover on Ebay…it fell apart in just a few months, as with many cheap items I have purchased there in the past. I guess you truly do get what you pay for but a smart shopper can get still great values with careful shopping. I just purchased tires and a Rustoleum Denier boat cover from Walmart online and give the product and service 5.0. The cover will be especially good for our Arizona sun and is of excellent, heavy duty material and stitching…will last a long time. The pricings were competitive and everything delivered on time and as promised. Walmart will be my first stop online for shopping. As always, we online purchasers….number one priority is price. Secondly, quality for the price. Kudos to |Walmart. Walmart could use more employees like Mrs. Carolyn S. @ #3184 Very nice and respectful and knows how to get you in and out And a safe and efficiently way! I was told at 1618 to take a survey online but my receipt has no id# on it. My SHOPPING EXPERIENCE AT THIS WALMART IS SATIFYING AND AMAZING. ALL STAFF MEMBERS MAKE THEMSELVES AVAILABLE FOR QUESTIONS. AND THERE ARE SHINNING STARS. MARIA AT SELF CHECK OUT IS AMAZING. ALWAYS WILLING TO HELP AND AWNSER QUESTIONS.POLITE WELCOMING I FEEL LIKE I HAVE WALMART FAMILY.THANK YOU MARIA AND ALL STAFF. Good experience today shopping at Walmart. Friendly and helpful. I had some confusion about a Straight Talk prepaid card recently and called the store for help….my experience was a very kind and helpful person by the name of Patricia @ Store 00454…..I had to end up going to the store the next day though I am very unable to ambulate easily….the same lady was called to help with my problem and even chose to deal with me with kindness and true sincerity and offered to try to solve my problem if I could bring my phone in….but with the steps she gave me I was able to get the code in as needed….This lady is to be highly commended for her pleasant personality and desire to make a customer happy….thank you Patricia!!! Lyle in the photo department was excellent. He went well above and beyond to help us. What an excellent employee to have. He is so knowledgeable and helpful. Store #03062 not enough cashiers had to wait ten minutes for a cashier! Last Sunday my phone went missing at Walmart Store 863 in Roanoke Alabama. The staff went out of their way to help me find it. I appreciate their help so much. Never did find it but this is a helpful store! I am a Wal Mart employee and I shopped at another store today. 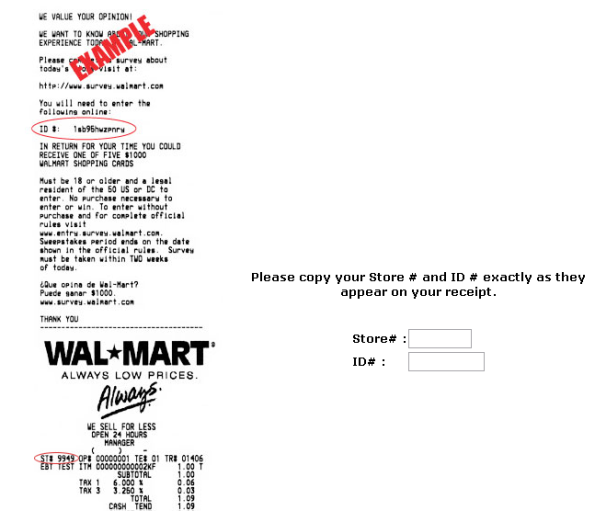 I shopped at store #05403 and was waited on by an Associate named Cleven. She was fantastic. Very knowledgeable and friendly. We need more Clevens on our frontlines. Brian (SLAMDUNK) assisted with my PickUp order March 29, 2019 @ 1:30 pm Kirkwood, Mo. He has helped me each time I’ve used this service. He is always kind and willing to help. I’m new to using this service and he always make sure I’m taken care of. He’s a tremendous asset to your company!! Yesterday I went to the Wal-Mart store on Foothill/Benson in Upland. The sales clerk in Electronics Johnathan was very helpful and explained everything about the Roku model I was buying. I was so impressed by his extensive knowledge and how patiently he told me what and how I could use it. I was very grateful as a Senior by the service I received that I will be coming back to this store because of the his Help and attitude. I would like to thank Wal-Mart for the great service I received from this employee. Used grocery pickup at 1619 Del Prado Ave in Cape Coral FL 33990. Jonnie brought groceries out to car promptly, was friendly, respectful and personable. We shop at our Community Supercenter and NHM if not daily, three to four times a week. 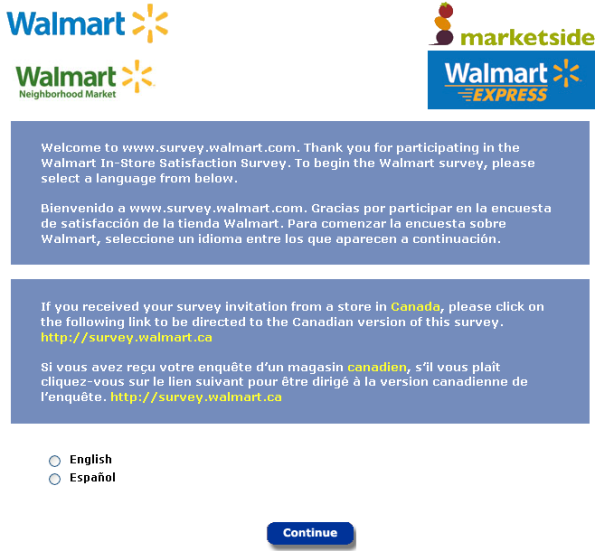 I tried taking this survey and the receipts I have DONOT have ID#’s. What do I do ? Im not happy with the kitchen dept product availability been there 3 times and there was supposed to be 3 on the shelf its still not there. I love the little Walmart in my neighborhood. The staff are just absolutely the best. The store is located on sharon Dr in Lexington KY. The cashier’s are very kind and very attentive to your needs. Shopping at the Williston, VT store yesterday, we encountered the store greeter named Beck. Beck greeted us warmly and seemed sincerely glad to see us. When we finished our shopping, Beck found a very small item in the bottom of the shopping cart which had been overlooked. Beck suggested that we go through a self check line if we still wanted it. Beck then helped me navigate the self check out and thanked us sincerely for visiting the store. Beck is a friendly, helpful and valuable employee. I hope we encounter each other again soon. OUR CLERK’S NAME WAS ETHELENA, SHE WAS VERY HELPFUL. I had a great checkout at store #02605 and cashier #007105. She was fast and extremely friendly. I will look for her the next time I check out. She knew exactly what she was doing and was very experienced I had a great check out . Very good store.I was shopping at Huntsville Walmart and I couldn’t find the thing I was looking for.I asked a person that worked there and she helped me.I told her thanks and she later on told me I could get the refreshing mints/candy things for free at the register.She said she remembered me and got the thing in that I wanted and could have it for free.The thing was a cost if you bought it was about worth $100.I am so thankful and she cashiers us everytime we go to Walmart.She later came to my birthday party and it was a great awesome amazing experience.My mom sews and the lady toke an order and my mom gave it to her for free.She said something on facebook and my mom’s business was soon out of order because people got mad that she got it for free but they have to pay and told my mom that she is greedy over them on money.My mom called them drunk because they made no sense.They got offended real easy and told her she was drunk.My mom later told me she needs to speak with me in private.She told me we are not going into Walmart no more.She toke me to Walmart and got excided and did the challenge whatever I touch I can get. I spent over $200 I was very frustrated to find they have no checkers only the 20 items or less line and the rest were self check out machines. There is a tiny shelf for your items to be placed on after scanning which is very frustrating! I had to bag my items and place them on the floor so embarrassing! After unloading everything to scan I could then pick up my items off of the dirty floor and place them back into my cart. I was overwhelmed by the amount of bags I had lying on the ground. Very disappointed in the fact that you don’t care about your customers I kindly asked a very friendly lady I think her name was Clara why there were no checkers and she said they all went home. She was as kind as could be and very apologetic which was by no means her fault. You should at least have one checker for people who have a lot of items it’s ridiculous that we have to scan items and place them on the floor. I was in the Cicero NY Walmart today. On my way out of the store I remembered that I needed to get some paraffin wax….almost impossible to find in March. I asked the associate working the door if she knew where I could find it. She told me to look in the baking supply area….aisle 16. I told her I would check back with her if it was there. Her name is Asia and I made sure to let her know how impressed I was that she knew exactly where to send me in a store that size to find such an uncommon item. Asia was knowledgeable and professional and deserves to be acknowledged for being such a great Walmart employee. Keep up the good work Asia. My survey today and complaint . Any one can easyly go trough the auto automatic cash out and walk away with goods with out notice by any one.!! You do have the right to check . Or eleminate them machine.! Now I never use that machine ,my wife and I go there every week and purchase our grocery and we pay cash.!! One minut there after the cash register you check again .!! My question is ,why you don’t train your chashiers to do a better job or find a way to do it.I understand random checks .!! nothing against it .Notice some of you security stop every one to be check . Some are older people or tired ladies from their work before go home. I just feel frustraded about it and harass all the time and you take my money. No one is really stealing, you have to address your way of controlling. If you find any one stealling have them ban of comming to your store or have them arrested in your store. Change the sytem have one of your employee help your chasier bag it and you handed baged to customer by the exit after your security check it not have your costumer standing therelike their are criminals.!! We go to Panama City Beach for 3 months each year. We love your store. Your employees are great as well as your greeters. For the very first time a Walmart floor employee spoke to me. His name tag read Matt, Dept. Mgr. He was stocking a shelf in a center aisle, as I walked by he looked at me and said “have a good day, Mam”. I was shocked as no employee as ever acknowledged me with a nod, smile or excuse me, they just walk by. I turned around and said “Young man, you are the first floor employee to ever speak to me and I want to thank you” he smiled and said “thank you, Mam”. This transaction was at the Walmart in Brookfield, MO. I had just recently said Walmart does a poor job of common courteous training. While I have your attention I do want to express my disappointment in that Walmart is releasing Jodi Key and Ronnie Anderson, both are greeters and have disabilities. I always look forward to a greeting from them. I did not know Sam Walton, however, I have read about him and I feel he would not approve of the current ownership or individual store managers doing this to long term employees. Jodi has been with Walmart 21 years, not sure about Ronnie. Also, I will not use a self-check-out this is taking a persons job. Limited check-outs does tax one’s patience and of course that displeasure is taken out on the cashiers. When a large corporation/business does not treat their employees fairly they certainly will not appreciate their customers. I pray for Walmart employees and certainly prayers for those in leadership roles. Thank you.